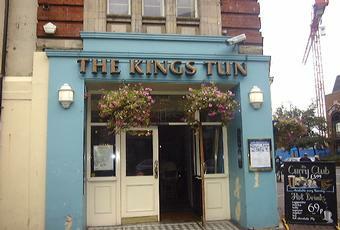 The King's Tun was my first stop a Kingston crawl yesterday. I was here for breakfast and a quick pint. As Lezford says, it's near the train station. It's also just round the corner from the bus station on Cromwell Road. Getting across the road isn't easy though. Next time I'll use the lights! As with most Wetherspoons, this one has 2 banks of handpulls and unlike many, there are different ales on each bank. Yesterday morning they had 11 ales - Greene King Abbot & IPA, Oakham Citra & Sharps Doom Bar are the regulars. Guests were Twickenham Grandstand, Strange Brew & Redhead, Arundel Sussex Craft Coffee Milk Stout, Dark Star Green Hopped IPA, Kissingate Toffee Cog & Surrey Hills Collusion. There were also 2 real ciders from Westons - Old Rosie & Marcle Hill, in addition to a mulled cider from them too. The interior is quite spacious. Apparently there are 2 floors. But I stayed on the ground and enjoyed a nicer than normal breakfast. Service from both the bar and the kitchen was quick and efficient. Certainly one of the better Wetherspoons I've been in. A Tuesday night football game in Kingston so me and my pal decided to meet in the Kings Tun. I got here around 6.30pm and as expected it was busy. A mix of ‘spoon’s punters, local workers and football fans all enjoying the cheap food and drink. Food was popular with the 3 people in front of me at the bar all ordering food, while I only need a few pints. Quick service from the 4 bar staff meant I didn’t wait too long. A decent range of ales (like one my last visit), I went for a few pints of Twickenham Breweries Summer Sun @ 4.4%. 4 pints for less than a £10.00, I no longer have a problem with ‘spoons pubs especially as 9/10 times the ale is well kept. We stayed for less than an hour but like the last visit the Kings Tun is a decent pub and worth a stop especially as it’s practically opposite the station. Almost a year since my last visit I dropped in at 11.45am on August bank holiday Monday for a quick beer while on my way to football locally. Miserable weather outside but very dry inside (of course) and this is probably part of the reason it was so busy. 2 girls behind the bar who were very good therefore getting served was not a problem. 11 ales on the 12 hand pumps. I went for a new ale for me which was Sequoia @ 4.5% from Thornbridge. A very nice drop and made all the better as it was ‘spoons prices. A decent ‘spoons that I’m sure I’ll visit again in the near future. Like drinking in a Beryl Cook painting. Now Beryl Cook was an excellent artist and looking at her work brings a smile, which is by and large more than you get sitting in this barn of a pub and knocking back the beer. However the presence of surging masses of people (not many of them, just masses) and solitary drinkers suggests her work. Not the best Wetherspoons. Not even the best in the Kingston area (that may be the Coronation Hall). It serves a purpose and will continue to do so. As with all Wetherspoons pubs this one is the watering hole of dimwitted old plonkers whose loud jabbering is embarrassing to those who prefer a quiet drink or good conversation. The beer is adequate and the service reasonable but the proliferation of Rab C Nesbitt lookalikes is likely to put the civilised drinker off. Ideal for baseball capped, beer bellied neanderthals but otherwise another one to be missed.